Hayen remembers thinking, “Here is something to help the students be more social justice-minded — and that I could do along with students and staff.” She was inspired to lead an Offering of Letters — the first of many in a history of advocacy that now spans 30 years and is still going strong. The locations and the letter-writers vary, but the Offering of Letters is always about engaging churches, campuses, and other faith communities in writing letters to Congress. The letters are presented as an offering to God before they are mailed. 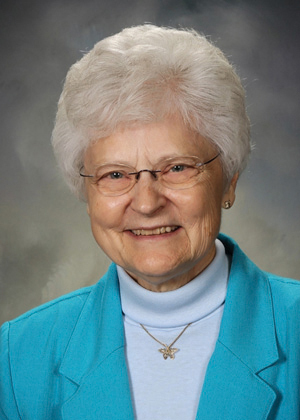 After 22 years of teaching, Hayen became the administrator of a motherhouse that brought together five communities of sisters. She led Offerings of Letters there and in the parish affiliated with the motherhouse. Later she became the Resident Services Coordinator for the Dubuque Housing Initiative—living space for low-income people sponsored by several congregations of women religious. “I came to help residents with life skills, from balancing checkbooks to nutrition to housekeeping,” Hayen says. One of those skills was advocating for policy change through Offering of Letters campaigns. Since 1996, Hayen has worked in the BVM Community’s Mount Carmel Motherhouse in Dubuque. She assists sisters with impaired vision or hearing — putting to work what she learned while earning a certificate in gerontology services. And, of course, she has brought Bread’s message with her to Mount Carmel. Hayen notes with appreciation that Bread continues to provide print resources for the Offering of Letters. She suggests that printing some of the materials in larger type would make it easier for older Bread members to read. In her free time, Hayen enjoys prayer, reading, T’ai Chi, and jigsaw puzzles. She says that puzzles allow her to reflect. “I even take them on retreat,” she says. She also enjoys getting together with her large extended family. Patricia Bidar is a freelance writer.